When Internet users download or share copyrighted content online, particularly using BitTorrent, they should presume that copyright holders are watching. Transfers that take place without the protection of a VPN, for example, are easily traced back to ISPs, who have the ability to link that activity to a specific account, when asked to do so. In many cases this results in an ISP forwarding an infringement notice to a customer on behalf of a rightsholder, to warn that an account may have been used to breach copyright. However, over the years some rightsholders (often referred to as ‘copyright trolls’) have taken things a step further by including demands for cash in their notices. “Such notices are deemed to be invalid under the regime,” government advice reads. Unfortunately, however, copyright holders are ignoring the new law. 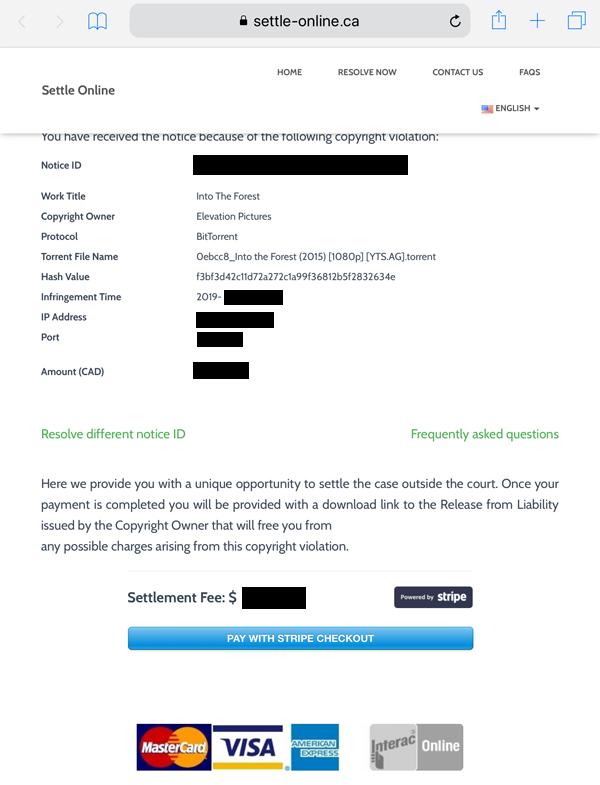 A notice sent by Eastlink, an ISP headquartered in Halifax, Canada, to one of its customers and reviewed by TorrentFreak, reveals a copyright holder breaching every single rule detailed above. Filed by anti-piracy outfit Digital Millennium Forensics, on behalf of Elevation Pictures, the notice claims infringement of the 2015 movie ‘Into The Forest’. It lists the time and date of the alleged infringement (in January 2019) along with the alleged infringer’s IP address. Of course, like all such companies, Elevation Pictures doesn’t want to take the matter to court. What it really wants is money. “In order to help avoid legal action, we have been authorized by Elevation Pictures to offer you a settlement opportunity that we believe is reasonable for everyone,” Digital Millennium Forensics writes. That offer, of course, clearly breaches rules (a) and (b) detailed above but the notice soon creeps ever closer to a full house by breaching rule (c) too. “To access the settlement offer for this claim, you have until [a date three weeks after the notice was issued (redacted for privacy reasons)] to visit the provided URL and complete the settlement instructions,” it reads. It’s no surprise that both copyright holders and anti-piracy companies are failing to respect the terms of the new regime. There are no penalties for sending non-compliant notices, so there’s no incentive for copyright holders and their agents to follow the rules. Furthermore, while there is no obligation on ISPs to forward non-compliant notices, that is clearly happening at Eastlink. The ISP does inform its customers that any notices falling foul of the rules (a), (b), or (c) are invalid, but sends them anyway. Legal jargon such as that highlighted above is not easily understood by the layman and can be difficult to comprehend without professional legal advice. It’s not unexpected, therefore, to find recipients who are overwhelmed by notice that simply shouldn’t have been sent. TorrentFreak wrote to Eastlink asking why clearly abusive notices are being forwarded to its customers. Jill Laing, Head of Public Relations & Media, informed us that the volume of notices being received presents a problem for Internet service providers. “The federally regulated Notice and Notice regime has resulted in ISPs receiving millions of such notices a year, which presents significant challenges for operators to filter,” Laing said. While it can indeed be reasonably argued that the government’s recent amendments go some way to dealing with the issue, the loopholes are clear to see and, as predicted, are now being abused by rightsholders. 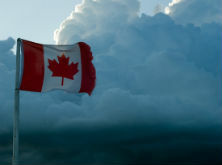 Late last year, a coalition including Canada’s major ISPs called on the Government to create a standard for copyright infringement notices. This would make it easier to handle the massive volume of notices. In addition, the companies asked for a meaningful deterrent to stop those who breach the rules. TF asked Eastlink if it had ever told complainants that sending abusive notices is unacceptable. We also asked whether the company would consider not sending abusive notices to customers in the future. We received no response to either question.